At the age of 76, George Philip Lehl decided he had worked long enough and it was time to reflect on his retirement and a life he could not have imagined as a young boy in Russia. Born on January 27, 1900, George emigrated from his hometown of Norka, Russia to the United States in 1912. Even in his advancing years, he carried some of the old country speech and many memories of Russia. George recalled that in the early 1900s, the political climate was deteriorating for ethnic Germans in Russia. Revolution, class struggles, minority discrimination and war all threatened Russia. The Czar needed soldiers for his army and conscription of the Volga German men was one way to fill a need, despite Catherine the Great's promise that they were exempt from military service forever. In 1905, during the Russo-Japanese War, George's uncle was selected in the fifth draft. As one of the first Germans from Norka to be conscripted, George's uncle (who spoke Russian) was sent to a military training school and became an officer. By 1912, many young men were being drafted as early as age 14. George's uncle and Pastor Wilhelm Stärkel (who had served as a minister in the United States) counseled the family to leave Russia. George's uncle felt that Russia was "ready to go down the drain." George's father, Philip Lehl, took the advice to emigrate. Parents Philip and Louise (née Traudt) along with their six children booked passage on the steamship Franconia which departed from Liverpool on May 28th and arrived in Boston harbor on June 6, 1912. Arrival in America resulted in culture shock for the Lehl family as they traveled by train to Portland, Oregon to join relatives who had already fled Russia. By 1917, the family was living at 761 NE Rodney. George recalled that he quickly learned English from other children on his block and advanced quickly in school despite the language barrier. Philip found work with the Oregon Washington Railroad and Navigation shops at the foot of Russell street while George worked for 10 cents per hour, ten hours per day, in his uncle's butcher shop which also served as a bakery and furniture store. By 1919, Philip owned his own garbage hauling business and George was also driving a truck engaged in road work. Philip and Louise Lehl had seven children by 1920, George being the eldest. A daughter, Pauline, married George Deering (Döring) who was known to everyone as "Doc". George was also born in Russia and came to the United States with his parents, Henry Deering and Anna Elizabeth Klaus. Doc and Pauline operated the Milwaukie Sanitary Service for many years and owned acreage in that city. You'll still find a street named Deering Court as a reminder. 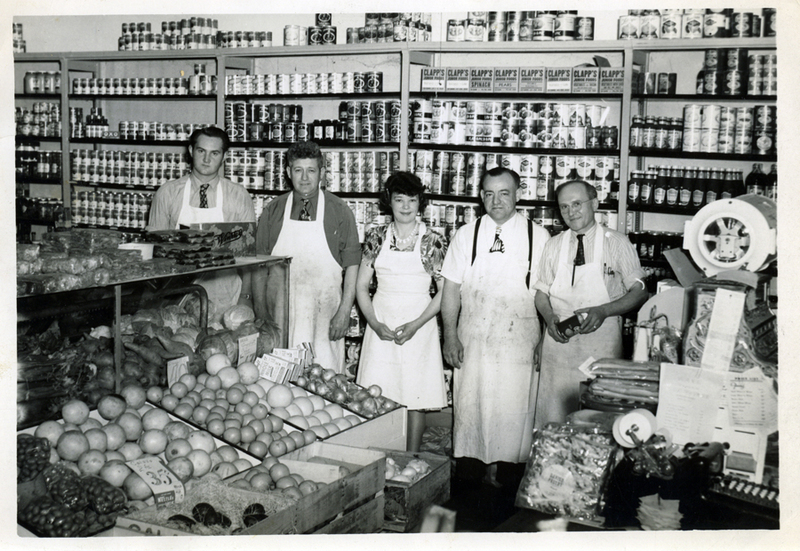 In 1922, George opened his own grocery store with a partner, Alexander B. Popp, from Fresno, California who had experience in the wholesale grocery business. 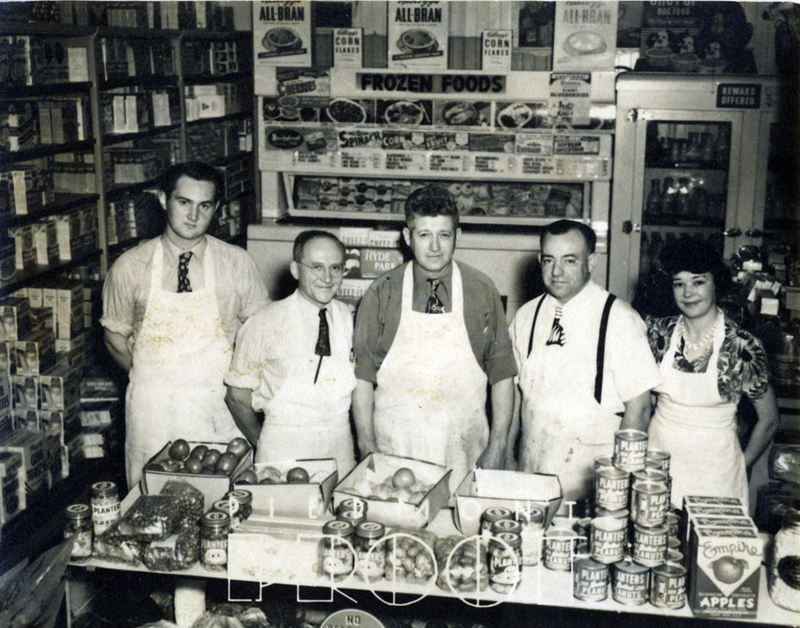 When the shop owned by George's uncle failed, he moved to a larger shop located at NE 10th and Failing and incorporated a butcher shop naming the store Lehl & Popp Grocery and Meat Market (the building burned in the 1960s). Owner and staff of the Lehl Grocery Store. George Lehl is standing second from the left. Photograph courtesy of Sheryl Scarbrough. The interior of the Lehl Grocery Store. George Lehl stands in the center. Photograph courtesy of Sheryl Scarbrough. My dad said as long as you have food to eat you have to divide it with people who are hungry. So as many as 15 people a day came to the grocery store for something to eat. We divided coffee, sugar, soup bones, everything that people needed into small packets that we could give away to those who needed it. My wife knew that I would always bring someone home for lunch and she was always ready. George's father lost his job at the railroad when he refused to work on Sunday's. Religion was much stronger in Russia than in this country; the richer people get, the less religion they have. This country was started on a religious basis, then the businessmen ran it for awhile. Now it's run by the attorneys and you can't expect much. Sixty percent of our congressmen are attorneys and this is why they can't get much done, because they just talk around in a circle. George had married by 1930 and was living at 501 Failing. By 1940, George and his wife Anna (née Walker) had one child, Jean and they were living at 3906 NE 10th, likely in the same building as their grocery store. In 1948, George's brother, Carl and his son Harlan founded Gresham Sanitary Service. In the mid-1950s, small grocery stores came under heavy competition from the supermarket chains causing George to think about a change in his work. At about this time, George's brother Philip (known as "Paddy") called him from Coos Bay, Oregon to tell him that there was a garbage business for sale there and he should consider buying it. Paddy Lehl and John Yeager had started their garbage business in Coos Bay in 1946. George took over the small business and made his first priority to buy a new truck. He made that truck last until the business expanded into handling containers (dumpsters) which were used at apartments and commercial buildings. With a new truck and a hired hand George continued to grow the business for 23 years. George died on August 26, 1983 in Coos Bay, Oregon.